Suitably high waist, nice long leg inseam, non-chafing seams, and a standard fly is usually included, sometimes not. Made of 100 % polyester knit. Wash at 60 degrees Celsius. Sizes in US-style easy system. 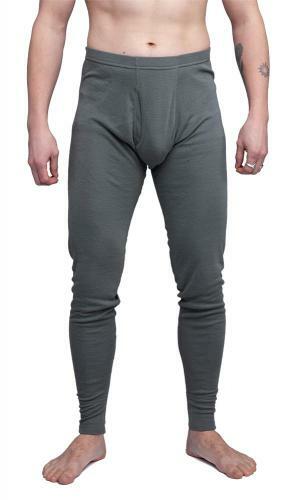 Just pick by your usual underwear size, these do stretch quite a bit. Used, but washed and clean, to the disappointment of some people. If you own a Dutch longsleeve undershirt or t-shirt, these Dutch long johns are a must! Show very minimal signs of use, but they are in almost unissued condition, much like the shirts. Similarly, there is a tag is on the back of the waist that reads "Ministerie van Defensie" (Ministry of Defense), and a label on one of the seams that reads "Thermowave". If you purchase a proper fitting size, and it appears to be way too small, don't worry, they stretch to a snug, comfortable fit (not to mention they are incredibly soft). Arrived in Western Canada in only 1 week as part of my first order. For the same price as the longsleeve undershirt, 12.99 CAD, you would be doing yourself a favour to buy these puppies! Perfect for layering in cold temperatures or even sleeping in. Thank you Varusteleka!